On November 8, 2013, Crosby Construction successfully completed the St. Joseph/Beckett Run Equalization Facility and handed the keys over to the city of Fort Wayne. This $11.5 million project is nestled in the back end of Sterling Ridge Cove, an upscale residential neighborhood off of North Clinton Street, north of Auburn Road. The project commenced in early June 2012, and was one of the largest construction projects in this area. 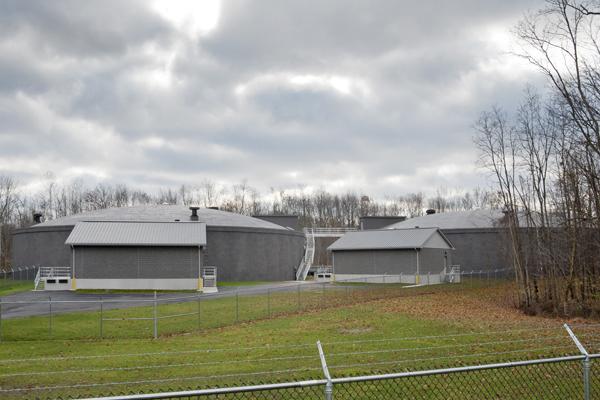 The project features two 160-foot-in-diameter, 35-foot-high concrete equalization tanks, a fully automated and complex sewage mixing and control system, a reinforced concrete lift station, a diversion structure, an electrical building, two mixing buildings, and an emergency generator. During a server wet-weather event, wastewater will be pumped from the lift station to the equalization tanks through a 30-inch forced main to one of the two equalization tanks. The tanks will be emptied back into the St. Joseph Interceptor by gravity at a controlled rate by 30-inch modulating-flow control valves and back through the 30-inch forced main. Diverts wastewater from the St. Joseph Interceptor sewer into the St. Joseph/Beckett Run Equalization Facility lift station. 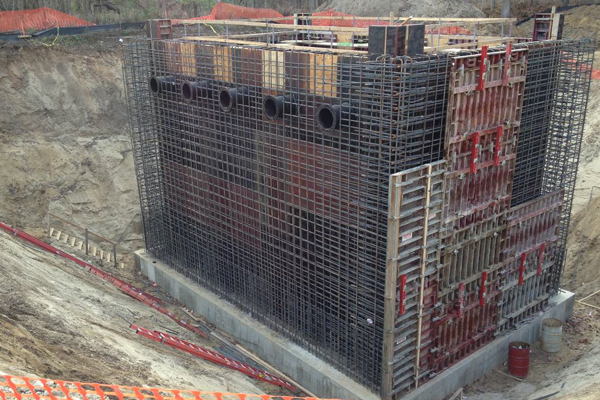 The diversion structure is a reinforced concrete structure that sits over the existing 54-inch interceptor sewer pipe and contains two 8-foot-wide manually operated weir gates and a 30-inch actuated plug valve. 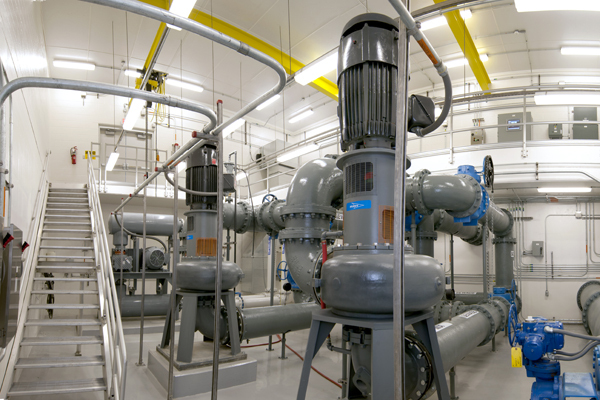 The reinforced concrete lift station houses four constant-speed submersible pumps with the capacity for an additional pump. 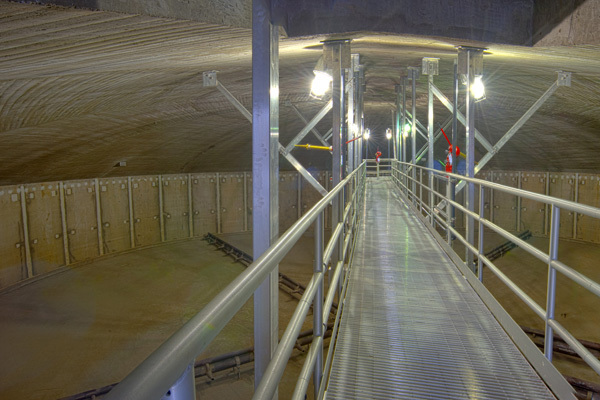 The lift station has the capacity of 18,850 gallons per minute (42 cubic feet per second) and is fed by a 48-inch gravity sewer from the diversion structure. The equalization tanks have a combined storage capacity of 6.8 million gallons (3.4 million gallons each). The tanks measure 160 feet in diameter with a 23-foot, 6-inch side water depth. There is approximately 2 feet of freeboard with an interconnecting 30-inch ductile iron overflow pipe between the tanks. 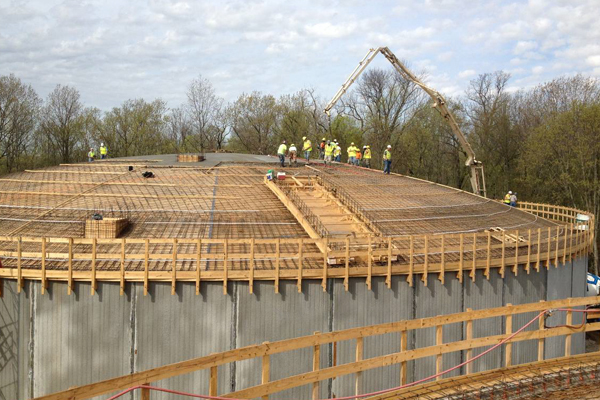 Both equalization tanks are fitted with access walkways leading from the access dormer to the center of the tanks and are supported from the reinforced concrete domed roof. Attached to the walkway are three wash-down cannons powered by a central well between the equalization tanks. The mixing and aeration system is designed to keep solids suspended within the wastewater and to ensure that the dissolved oxygen in the wastewater does not drop below 1 MG/L. The mixing system continues to run as the tanks are filled, stored, and emptied. One of the biggest challenges faced was the management and coordination of the numerous vehicles involved and the massive amount of construction material that had to be delivered to the project through the Sterling Ridge addition and surrounding neighborhoods. In addition, there were as many as 100 workers on the site at one time.